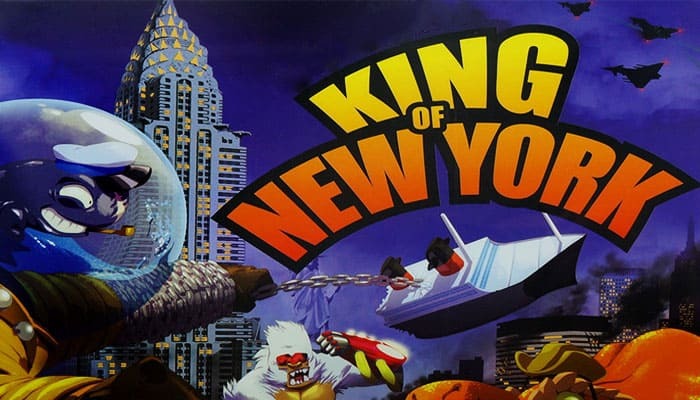 The goal of the game is to become King of New York. The game ends as soon as a Monster has earned 20 Victory Points ( ) or if it is the last Monster standing. Place the gameboard 1 in the middle of the table, accessible to all players. This represents the City of New York, comprising five distinct boroughs: Sta- ten Island, The Bronx , Queens, Brooklyn and Manhattan (divided into three zones: Lower, Midtown, and Upper Manhattan). Shuffle all the cards 2 - except the two special cards - together to form a face-down deck. Put the top three cards of the deck face-up on the table near the deck and the tokens. Place the two special cards, Statue of Liberty and Superstar, face-up beside the deck. Place the tokens 3 beside the board. They will be used for certain card effects. Put the six black dice 4 in the middle of the table. Keep the two green dice to the side (they're only used in certain circumstances). Each player chooses a Monster, takes its figure 6 and its Monster board 5, and sets the dials to 10 Life Points and 0 Victory Points. Form a pool of the Energy cubes 7. Shuffle all the Building tiles 8 together, and form stacks of three Buildings, Building-side- up. Place three of these stacks in each borough of New York. Don't look at the buildings below the top one; they will be revealed as the destruction ensues. Each tile depicts a Building on one side and a Unit on the other. These are things that the Monsters can destroy. Durability: 1 The number of required to destroy it. Reward: 2 for destroying it. If the tile you destroy is a Building, flip it over to its Unit side, and place it in the borough. If the tile you destroy is a Unit, remove it from the board. A Building with a durability of 1 always has an Infantry on its Unit side. A Building with a durability of 2 always has a Jet on its Unit side. A Building with a durability of 3 always has a Tank on its Unit side. To see who goes first, each player rolls the six black dice and the two green dice. Whoever rolls the most Attacks starts the game. Starting with the first player, and going clockwise: Place your Monster in the borough of your choice, except Manhattan. There can be no more than two Monsters in any borough. Note: From here on out, the rules and cards will refer to the players as Monsters. On your turn, roll the dice up to three times. For your first roll, you use the six black dice (you roll the green dice only when a card allows you to). For your second and third rolls (both optional), you can reroll any or all of the dice (even ones that you chose to keep on a previous roll). After your final roll, the symbols on the dice indicate your actions for this turn. You can resolve the dice in any order. However all dice of the same type must be resolved before resolving another type. If no one is in Manhattan you must move there. When you arrive in Manhattan, you must place your Monster on Lower Manhattan on the 2-4 space. If another Monster is anywhere in Manhattan, you have two options: You can move to any borough that doesn't already have two Monsters in it (except Manhattan), or you can just stay in your borough. If you were already in Manhattan, advance to the 2-4 space in the next zone up in Manhattan. Note: Once you are in Upper Manhattan, you no longer move during this phase. If you were already in Manhattan, you may not move to another borough (unless you have been damaged by another Monster's attack). After moving, you can buy one or more cards from those available. You are also welcome to spend 2 Energy cubes (2 ) to discard the three available cards and three new ones. You can buy and/or discard cards in any order you like, and as many times as you want, as long as you have the Energy cubes to do so. Each time you buy a card, immediately reveal a replacement for it from the deck. Example: Kong has 10 and doesn't like the cards currently available. He spends 2 to discard the three cards and reveal the next three. He still has and sees an interesting card that costs 3 . He buys it and reveals a new card. He still has 5 which he decides to keep for another turn. Certain card effects activate during this phase. This is the end of your turn. Pass the dice to the player on your left. Each die has 6 symbols. You gain 1 Energy cube for each you roll. You can hoard Energy cubes until you want to use them. You deal 1 damage to Monster(s) for each you roll. 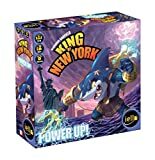 If you are in Manhattan each you roll deals damage to all Monsters outside Manhattan. 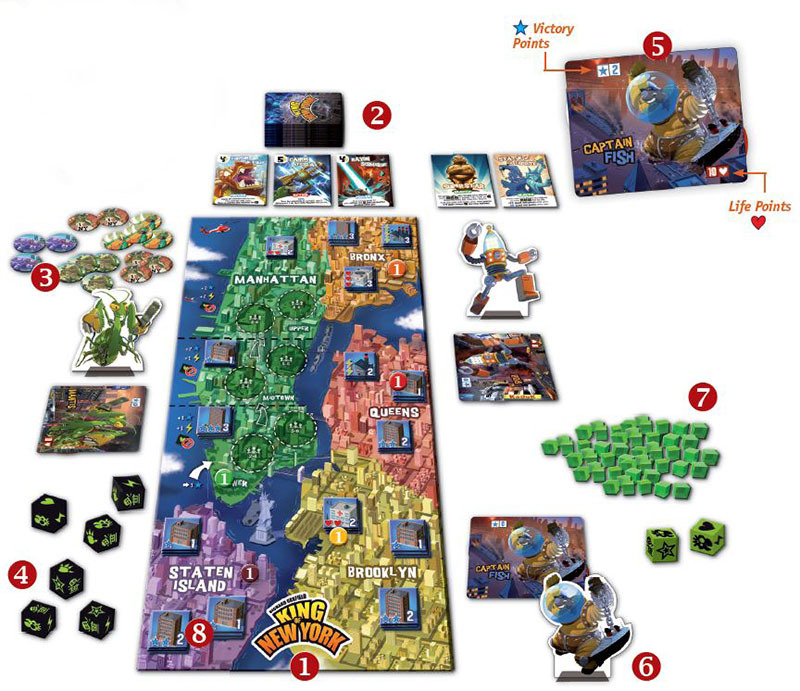 If you are not in Manhattan each you roll deals damage to all Monsters in Manhattan. Each causes any Monster(s) damaged to lose 1 Life Point (1 ). If a Monster loses its last Life Point ( , it is eliminated. If there are no Monsters in Manhattan at the start of your turn, you don't inflict any damage, even if you roll . Each you roll allows you to heal 1 Life Point ( ) that you've lost, unless you are in Manhattan. A Monster cannot have more than 10 . You destroy 1 Durability of a Building or Unit in the borough that you are in for each you roll. The Durability of a Building or Unit indicates the number of you must roll to destroy it on your turn. When you apply as many Destruction Points as the Unit or Building's Durability, it is destroyed. You gain as many (for High-Rises or Tanks), (for Power Plants or Jets), or (for Hospitals or Infantry) as indicated on the tile. When you destroy a Building, turn it over to its Unit side, and place it in the same borough. If there are still Buildings in the stack, this will reveal a new one. You can destroy the new Building immediately if you have enough remaining. When you destroy a Unit, take it and put it in front of you. You cannot destroy a Unit on the same turn that it appears. If you have enough to destroy a Building or a Unit, you must do so; however you are not required to optimize your . If you roll fewer than nothing happens. If you roll or more, you take the Superstar card, and place it in front of you. You immediately gain 1 and 1 per beyond the first three. From now on, as long as you have the Superstar card in front of you, each you roll earns you 1 . As soon as another Monster rolls a , he steals the Superstar card from you. If you rolled , the Units in your borough attack you. You take 1 damage per Unit tile in your borough. If you rolled , the Units in your borough attack all the Monsters in your borough (including you, of course). Each Monster in your borough takes 1 damage per Unit tile in your borough. If you rolled or more, all Units in the entire city attack. Each Monster takes 1 damage per Unit tile in his borough. Moreover, by rolling or more, you trigger a counterattack by the entire army, and you become the defender of the city! The Statue of Liberty comes to life and teams up with you. Take the Statue of Liberty card and place it in front of you. As long as you have the Statue of Liberty card in front of you, you have an extra 3 . You lose the extra 3 as soon as you lose the Statue of Liberty. No Monsters start the game in Manhattan. If there are no Monsters in Manhattan at the end of your turn, you must move into Manhattan. Note: The three zones of Manhattan - Lower, Midtown, and Upper - form a single borough. Therefore, there can be only one Monster in Manhattan, regardless of which zone it's in. 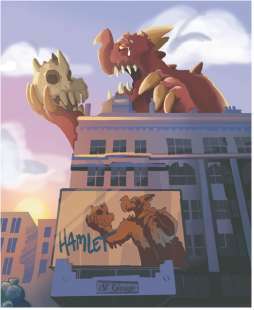 Buildings and Units in Manhattan are accessible to the Monster in Manhattan regardless of zone. 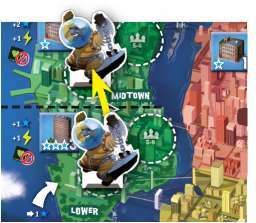 Similarly, allows Units in Manhattan to attack the Monster in Manhattan, regardless of zone. If you are attacked while you are in Manhattan, you may flee Manhattan, to leave your place to the Monster that attacked you (he must move into Manhattan during his movement). You still take any damage he deals you. This is this only way you can leave Manhattan. Note: A Discard card that directly damages you is not an attack. If an attack eliminates you while you are in Manhattan, the Monster that attacked you must move into Manhattan during his Move step. You earn 1 when you seize control of Manhattan (->1 ). Place your figure in Lower Manhattan. While in Manhattan, you cannot use to heal, but it can still serve to trigger other game effects; and you can always use cards to heal yoursel. If you are in Manhattan, your deals damage to all Monsters outside Manhattan. If you are outside Manhattan, your deals damage to all Monsters in Manhattan. The game ends at the end of a turn if a Monster has reached 20 Victory Points and survived, or if there is only one Monster still in the game. 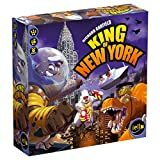 The Monster with 20 or who is the last survivor wins the game and is crowned King of New York. If all Monsters are eliminated in the same turn, nobody wins.